Apple's website in China has published a detailed response to accusations by the country's state owned media, refuting claims that iOS tracks users' locations in a firm but politely worded statement. A posting titled "Your Location Privacy," presented in both Chinese and English on Apple's Chinese website, states "Apple is deeply committed to protecting the privacy of all our customers. Privacy is built into our products and services from the earliest stages of design. We work tirelessly to deliver the most secure hardware and software in the world." Alluding the advertising-supported nature of Google's Android, Apple's statement continued, "unlike many companies, our business does not depend on collecting large amounts of personal data about our customers." Instead, Apple wrote, "we are strongly committed to giving our customers clear and transparent notice, choice and control over their information, and we believe our products do this in a simple and elegant way." Chinese propaganda targeted Apple over location tracking "concerns"
On Friday, China's state run China Central Television network published a report referring to iOS' Frequent Location feature as being a national security concern that might reveal sensitive information, "even state secrets," according to coverage of the issue by the Wall Street Journal. The same CCTV network directed a similar populist attack on Apple last year regarding the company's warranty policies, alleging that it was "biased against Chinese consumers in its warranty and consumer service policies." Apple's chief executive responded with a public statement noting that a lack of public communication could lead to "misunderstandings," for which he offered Apple's "sincere apologies." The statement clarified Apple's policies, noting that "nearly 90% of customers expressed satisfaction with our repair services, and consumer satisfaction is the most important criterion for Apple to measure its own success." It continued, "our customers want and expect their mobile devices to be able to quickly and reliably determine their current locations for specific activities such as shopping, travel, finding the nearest restaurant or calculating the amount of time it takes them to get to work. We do this at the device level. Apple does not track users' locations - Apple has never done so and has no plans to ever do so. "Calculating a phone's location using just GPS satellite data can take several minutes. iPhone can reduce this time to just a few seconds by using pre-stored WLAN hotspot and cell tower location data in combination with information about which hotspots and cell towers are currently being received by the iPhone. In order to accomplish this goal, Apple maintains a secure crowd-sourced database containing known locations of cell towers and WLAN hotspots that Apple collects from millions of Apple devices. It's important to point out that during this collection process, an Apple device does not transmit any data that is uniquely associated with the device or the customer. 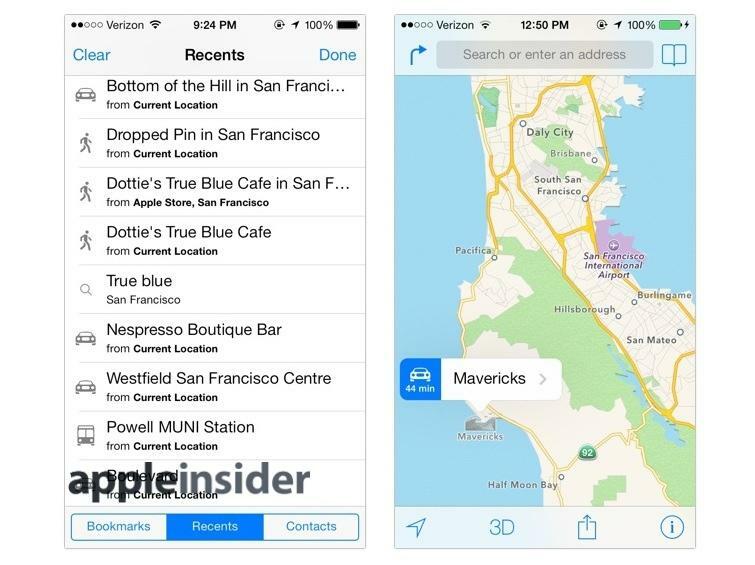 "Apple gives customers control over collection and use of location data on all our devices. Customers have to make the choice to enable Location Services, it is not a default setting. 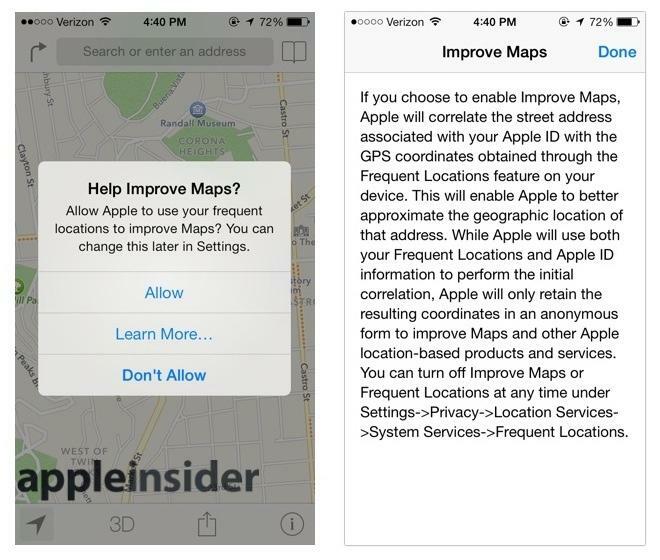 Apple does not allow any app to receive device location information without first receiving the user's explicit consent through a simple pop-up alert. "Frequent Locations are only stored on a customer's iOS device, they are not backed up on iTunes or iCloud, and are encrypted"
This alert is mandatory and cannot be overridden. Customers may change their mind and opt-out of Location Services for individual apps or services at any time by using simple 'On/Off' switches. When a user turns 'Off' location data for an app or service, it stops collecting the data. Parents can also use Restrictions to prevent access by their children to Location Services. "When it comes to using iPhone for traffic conditions, iOS can capture Frequent Locations to provide commute information in the Today view of Notification Center and to show you automatic routing for iOS in CarPlay. Frequent Locations are only stored on a customer's iOS device, they are not backed up on iTunes or iCloud, and are encrypted. Apple does not obtain or know a user's Frequent Locations and this feature can always be turned 'Off' via our privacy settings. "Apple has never worked with any government agency from any country to create a backdoor in any of our products or services"
"Apple does not have access to Frequent Locations or the location cache on any user's iPhone at any time. We encrypt the cache by the user's passcode and it is protected from access by any app. In the interest of even greater transparency for our customers, if a user enters their passcode successfully, they are able to see the data collected on their device. Once the device is locked no one is able to view that information without entering the passcode. "As we have stated before, Apple has never worked with any government agency from any country to create a backdoor in any of our products or services. We have also never allowed access to our servers. And we never will. It's something we feel very strongly about." Reporting on the subject, CNET wrote, "It's possible, though not confirmed, that this CCTV report was retaliation for American officials on Thursday saying Chinese hackers broke into US computer networks that house the personal information of federal employees. China often responds to US accusations of cyberspying by taking aim at American tech companies. Apple, Cisco, Google, IBM, and Microsoft are just a few of the tech companies to get caught in the crossfire." Apple has been extremely cautious in handling the Chinese market, which is already as important of a market for the company's products as the United States. Unlike the U.S. however, China continues to report tremendous new growth in device sales. Data from Umeng, China's largest analysts firm, indicated that the vast majority of premium smartphones in China are iPhones. 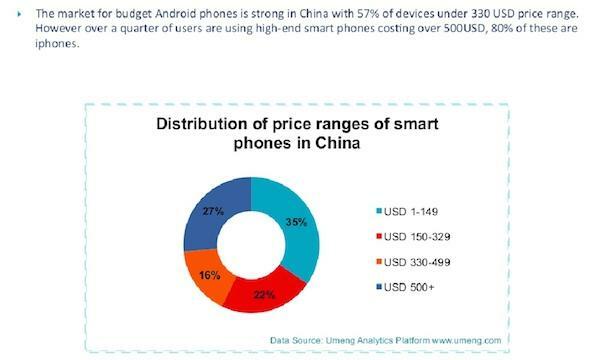 "The market for budget Android phones is strong in China with 57 percent of devices under the $330 price range," the firm reported in March. "However, over a quarter are using high end smartphones costing over $500; 80 percent of these are iPhones."